This week I've had the huge pleasure of working alongside Caitlin Fisher, Steven Hoffman and Susan Rogers Van Katwyk in person, and LaLaine Ulit-Destajo and Sean Sollé in cyber, to install Shadowpox: The Antibody Politic at UNAIDS in Geneva, Switzerland, in time for the WHO's 70th World Health Assembly. <Immune Nations>, an evidence-based art exhibition about the constructive role that art can play in global political discourse around life-saving vaccines, opened yesterday and will run till the end of June 2017. 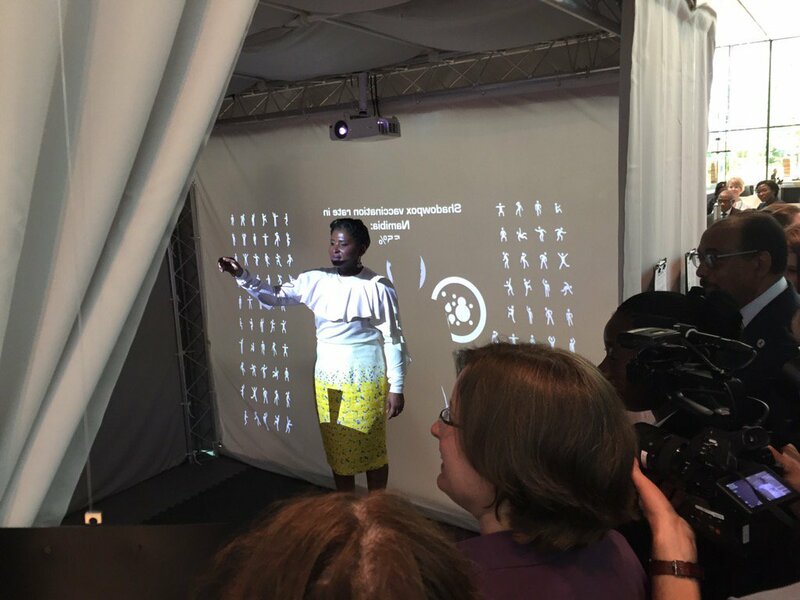 The Lancet reviewed the exhibition, calling Shadowpox "undoubtedly one of the most powerful and playful ways to illustrate both the individual and population-level implications of community immunity." La Repubblica quoted Hoffman describing the paradox that the exhibition highlights: "On the one hand, millions of the world's poorest people do not have access to vaccines, while on the other, millions of wealthy people refuse to vaccinate themselves or their children because of unfounded safety fears." The Vaccine Project, the three-year interdisciplinary collaboration that led up to this exhibition, was completed as part of the International Collaboration for Capitalizing on Cost-Effective and Life-Saving Commodities (i4C) that is funded through the Research Council of Norway's Global Health & Vaccination Programme. Kaisu Koski: Conversation with Vaccine-critical Parents (2017), 30934539, Excerpt from AV-arkki on Vimeo.